You: Hey, I just bought a new Concept2 rowing machine and I want to get in shape, and maybe do one of those cool indoor races someday. How should I start? Me: That’s great! The concept2 is a great piece of machinery. You’ll get a lot of good use out of it. Tell me, did you get it new? You: Yep, brand new. It came with the PM5. Me: OK. That makes getting started really simple. Me: Do you like the idea of using data from your rowing to train better and make faster progress? Me: Here’s what I think you should do to get started…. Go get yourself a heart rate monitor. I really like the wahoo tickr. It supports both Bluetooth-LE and ANT+ so you can use it with the rowing machine and hook it up to your phone at the same time. It also seems to give nice reliable readings and the battery lasts pretty well. But any heart rate monitor that supports either Bluetooth-LE or ANT+ will work. You should probably use the kind of heart rate monitor that goes around your chest though. Your wrists flex a lot when you row and that messes up the readings. Go and create an personal online logbook at the concept2 website. The key to improving over time is to have a good idea about what you’ve done in the past. The logbook is a great place to keep track of when you have rowed, how far and how fast. Concept2 also runs challenges throughout the year where you can participate as an individual or as part of a team. Go and get the ErgData app from the App Store or Google Play and put it on your mobile phone. This application hooks up you phone up to the PM5 and records your workouts. It also shows you some interesting data about how well you are rowing in real time. It basically acts like a second monitor for the rower. Go and register at rowsandall.com. 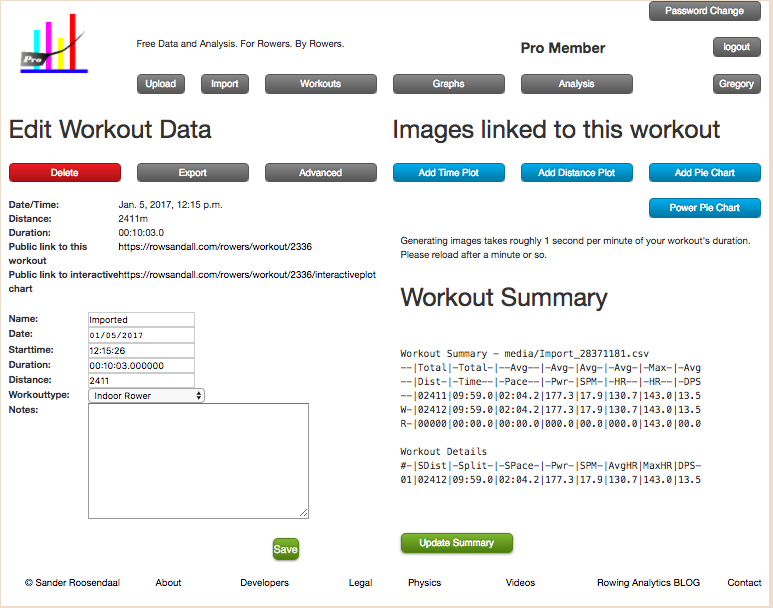 This site also includes an online logbook, but includes tools to track progress, and analyze how well you did in your workouts. You can learn things that will help guide your training. The website is free for basic use. For now, don’t bother doing much in the profile screen. You can do that later. Connect ErgData to your concept2 online logbook. you can do that in the settings screen of the Ergdata app. Once you do it once, you wan’t have to do it again. 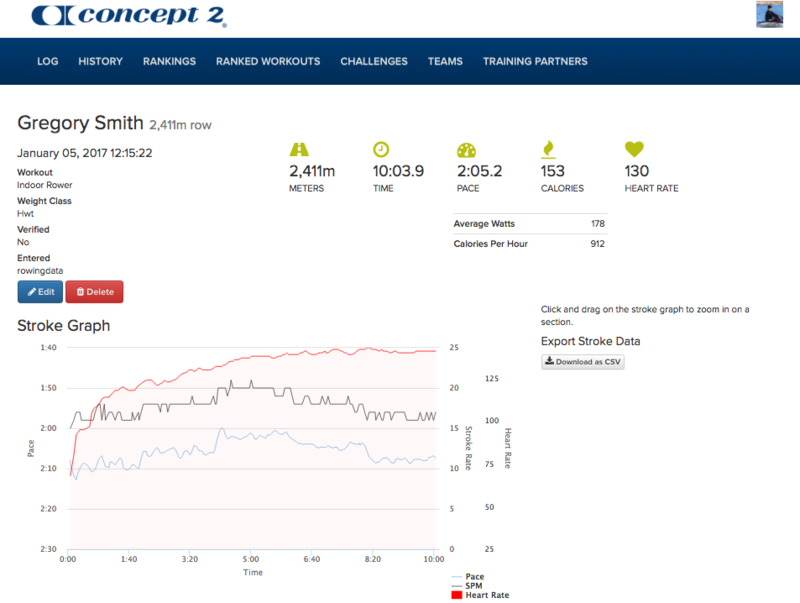 Connect your rowsandall.com account to your concept2 online logbook. This is easy to do. Log into rowsandall, and click the import button. This will take to a screen that looks like this. Just click the concept2 logo over on the right side of the screen. 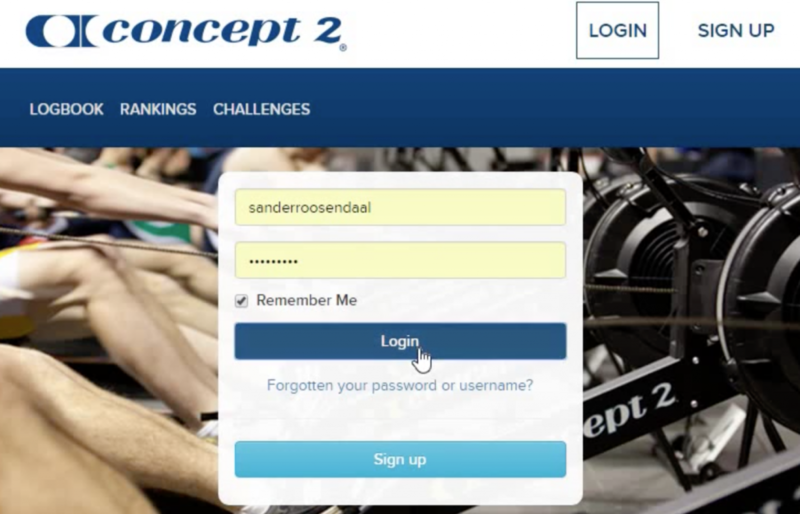 This will bring you over to the concept2 website, you might see a login screen like this. Sign into your online logbook, and you’ll see this. Choose “Approve rowingdata”, and you are good to go! What you are going to do is do a quick row to just check that everything is working OK. Put on your HR monitor. If you have the Tickr, you can check that it’s alive because the little blue LED will flash if it is sensing your HR and trying to connect by Bluetooth. Grab your phone and sit on the rower. Turn on the PM5 by pushing the “Menu” button. Push the “More Options” button, and then the “Connect HR Sensor” button. It will take a few seconds to search for your HR strap, but it show up on the screen. choose it, and then push “confirm”. Push the “Turn on wireless connection” button on the PM5. Then launch ErgData on your phone. After a few seconds, the PM5 should say “Connection successful”, and you should be able to see your heart rate over on the ergdata app. So, let’s take stock. Your HR monitor is connected to the PM5, and the PM5 is connected to your phone. Pretty neat. Now its time to row. Push Menu, and then push “select workout”, choose “standard workouts”, then choose “2000m”. Push the little check box button. On the ergdata app, you can swipe over two screen and you will see your local log. Push the “sync” button at the top of the screen and it should send the data about your row up to the concept2 online logbook. 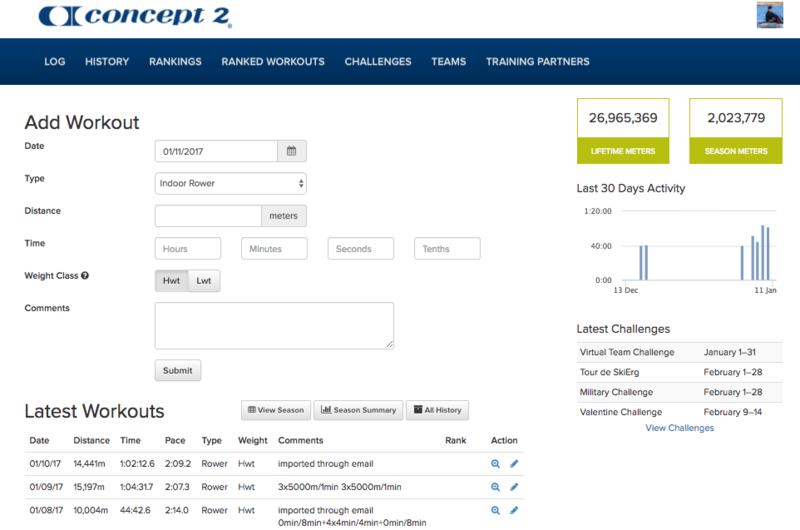 Head over to the concept2 online logbook. You should see an entry in the logbook for the row that you just did. If you click on the little magnifying glass by the row, you will see the details about your row. You should see a little chart like this that shows heart rate, stroke rate and pace. This data is recorded by ergdata for every stroke that you take and it was transferred up to the logbook. If any of those are missing, then something didn’t go right, and we’d be happy to figure out what it was. But, let’s assume that it all worked OK.The online logbook is nice, and it’s good to be able to see this summary of your row, but it isn’t very flexible. That’s where rowsandall comes in. Getting your rowing data over to rowsandall is easy. Just surf on over to the rowsandall site, and click on the import button. That will take you to this screen. click the concept2 logo over on the left. When you do this, rowsandall will go fetch a list of your recent workouts from the concept2 online logbook. You should see your 2000m row on this list. If you click on the word “Import”, it will bring your row into rowsandall. When you import your row, you will end up over on the workout edit page. This is like the workout detail page over on the concept2 website. On this page you can generate summary time or distance plots, and also pie charts for your heart rate and power during the row. Congratulations! You have done your first connected row and gotten your data over into two places where you can do cool stuff with it. Well, now the fun begins. Here’s my advice. Spend a couple weeks just rowing. Slowly increase the distance you are rowing. Experiment rowing at different stroke rates. Experiment rowing with more and less power in each stroke. 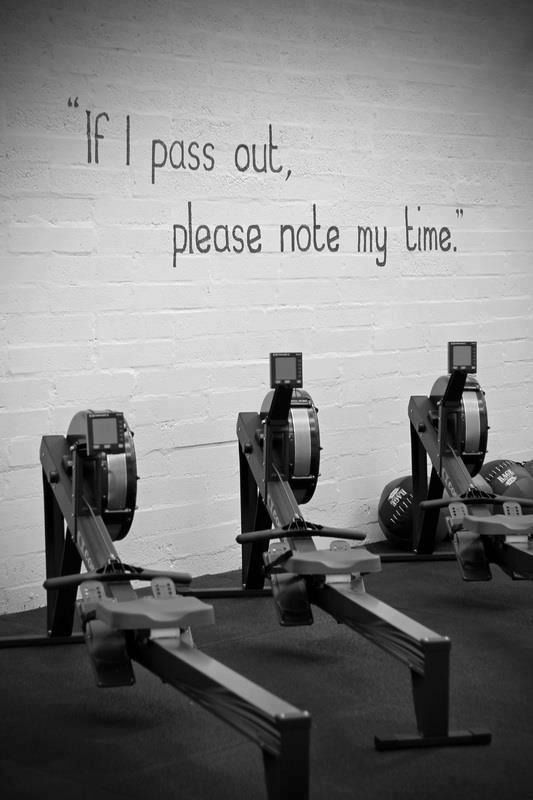 Just get used to rowing. After you’re comfortable, go watch the technique videos over on the concept2 technique page. Then either get someone to watch you and tell you how closely you come to that form, or film yourself and review it. It pays big dividends to get your technique right as soon as possible. Then you don’t have to try to correct any bad habits later. Do your first “real” 2k. Almost every training plan will use your current 2k score to fugure how fast to row in different workouts. Pick a training plan. You can just freestyle and do whatever you like on a day to day basis, and you’ll still make a lot of progress over the first couple of months, but having a structure will help you make long term improvements. Take a look at these three to see what suits you best. Good luck with your new rower. Post a comment or question if you have any problems.